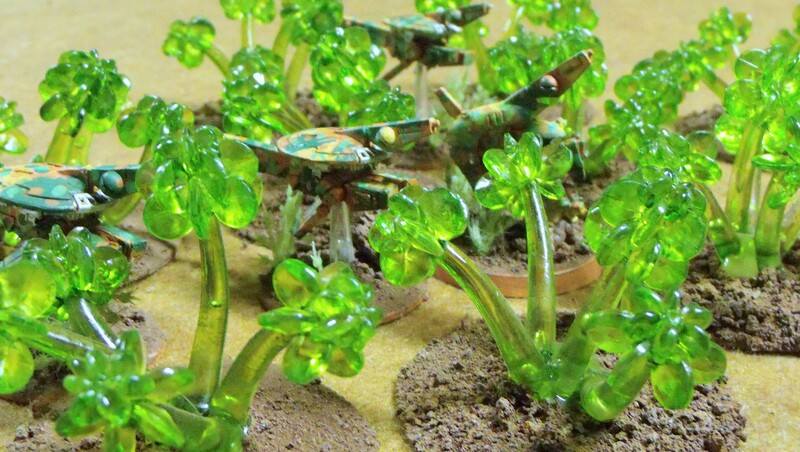 Plastic beads are a great source for building materials when making alien looking plants. They come in a very wide variety of sizes and shapes and can be used in many different ways. Some beads have a rounded organic shape already, but even the very angular ones work great after they have been heated a little and lose the sharp edges. The easiest way to use plastic beads is to simply pile them up and heat them till they shrink just a little bit and stick together. If you do this on top of rocks it makes a very convincing looking fungi or moss like plant. Many beads are designed to stack on top of themselves. These nesting properties make bead stacking very easy as long as you don’t go too high. If you want to do something tall (like a tree trunk) then simply use a small piece of wire as an armature to keep it from falling over. A simple round bead or a smaller size of the same bead works nicely to top off bead stacks. Fishing line also works nicely to create a different look. If you happen to have any unused flying stand posts lying around they can be used to make some nice stems to raise the beads up off the ground, especially when heated to get more organic shapes. How did you turn the flying stand posts green? We used Tamiya clear acrylic colors on the flying stand rods. For a more in-depth explanation look at the article “Easy to make Crystal Terrain (part one)”. We covered how to paint the clear plastic in that article. I’m done with my first batch of attempts. My logic was that those gelatinous plants would not occur in a normal environment and that they were probably there because the ground wasn’t suitable for normal plants, so I started with a baking soda + rock base and then added a few layers of “gelatinous substrate”. They look great! The ‘ground’ looks bizarre; it works really well with the plants.